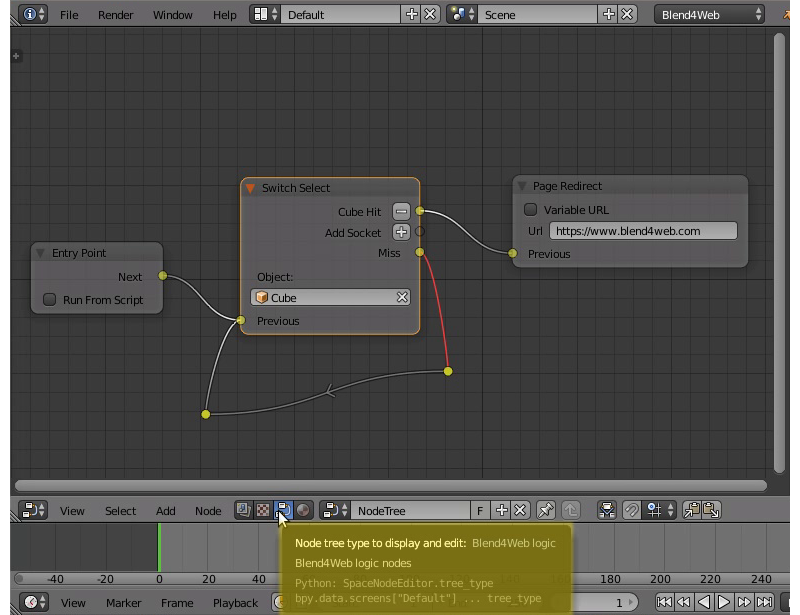 Visual programming is performed by creating logic node tree in the node editor area in Blender. These nodes can extend the scene functionality significantly without any coding. To activate logic on the given scene set the Logic Editor property in the Scene tab and append/select active node tree. 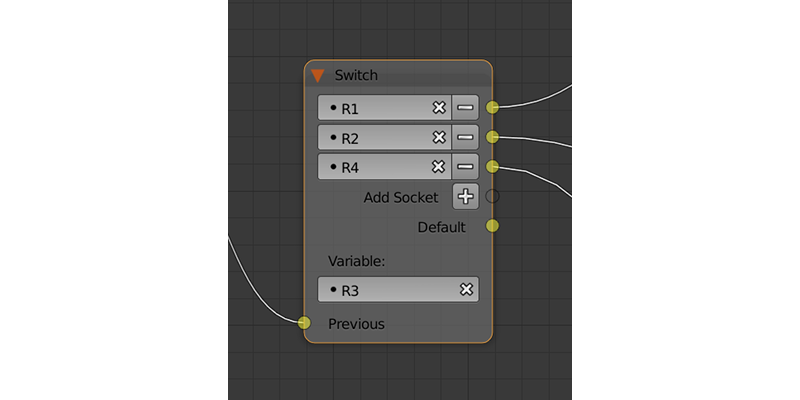 Nodes are created by using standard Blender keyboard shortcut Shift+A. The nodes themselves are logic blocks that are executed from the Entry Point node which has no inputs and only one output. All other nodes have both inputs and outputs, and can be inserted in any place of a logic tree. The exception is Page Redirect node, which can be inserted only to the end of the node tree. The nodes which have two outputs allow branching, thus the next leave is selected based on condition specified for such nodes. For implementing complicated logic there are variables that can have either numeric or string values. The variables can be used for storing some scene state (e.g. this can be a counter of animation playbacks, character’s health points etc). All available nodes are described below. This is where the script starts. By using multiple entry points you can create multi-threaded applications. If this parameter is enabled, the entry point can be triggered via API by using the run_entrypoint method. Can be used to trace the selection of any object from the object list. This parameter will pass the control to the next node if the user selects (with a mouse or by touch) an object mentioned in the parameter’s name. 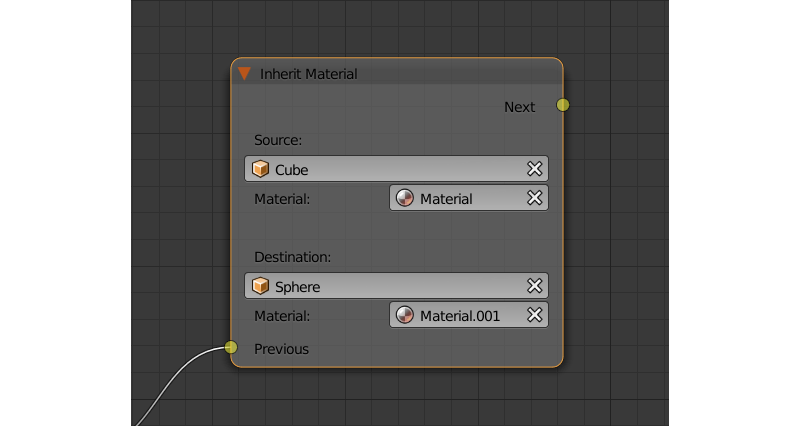 The Select node has one such parameter by default, but you can add new ones and remove existing ones (the node can even have no such parameters). This parameter will pass the control to the next node when the user selects any object with the Selectable property enabled (or used by another Select node), but not specified in the Select node. One of the objects that the user can select. These parameters are automatically created and deleted when you create or delete a Hit parameter. The number of such parameters is always equal to the number of the Hit parameters. If this parameter is enabled, you can specify an object variable in the corresponding Object field. Sets a variable that will be used to store a selected object after an event of selection. Go to the specified node if the certain condition is met. The parameters (operands) can also be variables that are activated using the corresponding switches. Equal (=) - first operand is equal to the second. Not Equal (!=) - first operand is not equal to the second. Less Than (<) - first operand is less than the second. Greater Than (>) - first operand is greater than the second. Less Than Or Equal (<=) - first operand is less than or equal to the second. Greater Than Or Equal (=>) - first operand is greater than or equal to the second. First operand of the logical condition. Contains a numeric value or a string (if the String Operators parameter is enabled). Can be specified in the node or can be a link to one of the variables (if the Variable parameter at the right of it is enabled). Second operand of the logical condition. Works the same way as the first. The type of the operands. Available values are Number (the default option), String and Object. This node compares several variables with a given value and executes a conditional jump depending on the outcome. One of the variables used for comparison. If the value of the variable specified by this parameter is equal to the value of the Variable parameter, control is passed to the node connected to this output. 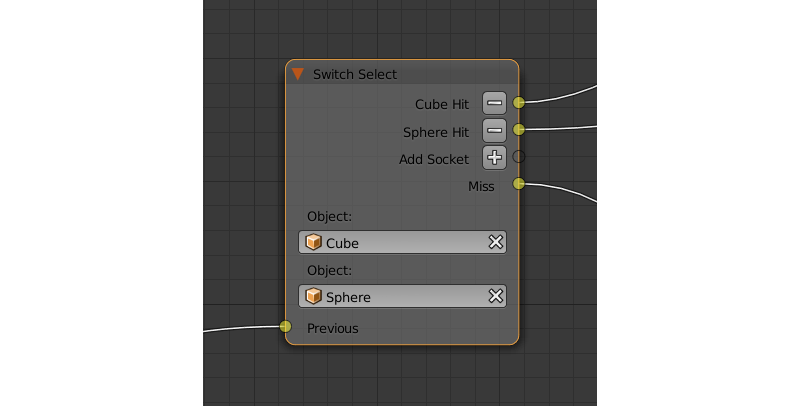 The Switch node has one such parameter by default, but you can add new ones and remove existing ones (the node can even have no such parameters). This output will pass control to the next node in case none of the values are equal to that of the variable set by the Variable parameter. Specifies a variable used for comparison. This value can be set directly or via a variable (if the Variable parameter is enabled). A list of the input parameters of the function. Each parameter can be either a variable or a link to a scene object. The number of the input parameters can be adjusted. By default, this list is empty. Input parameters are transferred to the callback function as an array that servers as the first argument of the function. Specifies an input parameter. This parameter can be a variable (R1 by default) or a link to a scene object, depending on the value of the Type parameter (each one of these parameters always has a corresponding Type parameter). The type of the corresponding input parameter. It can have one of the two values: Variable (in this case, one of the variables will be used as the parameter) and Object (a link to a scene object). A list of the output parameters. Empty by default. The number of the output parameters can be adjusted. An array that consists of the output parameters serves as the second argument of the callback function. Specifies one of the variables that will be used as an output parameter. By default, R1 variable is used. This node can be used to combine several logic nodes into a function - a subroutine that can be accessed from the main logic setup. This node always serves as a starting point of a separate node tree and thus feature no input parameters. The list of the function’s input parameters. This list is empty by default, but you can add and remove variables using + and - buttons. Each variable can also be named. The list of the function’s output parameters. Works in the same way as the In Params list. This node can be used to call a function defined by a Define Function node. The name of the node tree from which the function is called. The list of the variables to set the input parameters of the function specified by the Function parameter. The list of the variables to store the output parameters of the function specified by the Function parameter. This node can be used to control NLA animations. The Play Timeline node plays NLA fragment starting with a frame specified by the marker. Animation plays until next marker is encountered, or to the end of the scene’s timeline. After that, control passes on to the next node. First frame of the animation. If this parameter is not specified, the animation plays from the current frame, i.e. if animation hasn’t been played yet, playback will start from the first frame of the timeline. If playback has been stopped with the Stop Timeline node and then started again, it will continue from the last played frame. Last frame of the animation. If this parameter is not specified, an animation plays to the next marker (or to the end of the timeline, if there isn’t any). 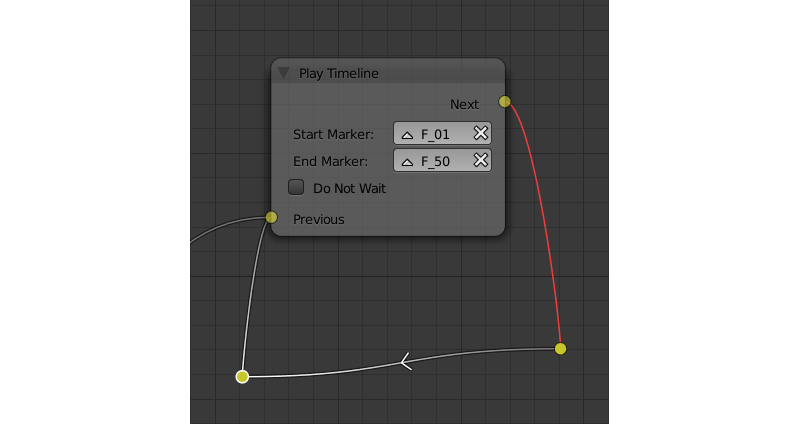 If this parameter is enabled, the Play Timeline node will pass the control to the next node on starting the animation playback. If it isn’t, the control will be passed to the next node only after playback is finished. Stops the playback of the NLA animation started by the Play Animation node. 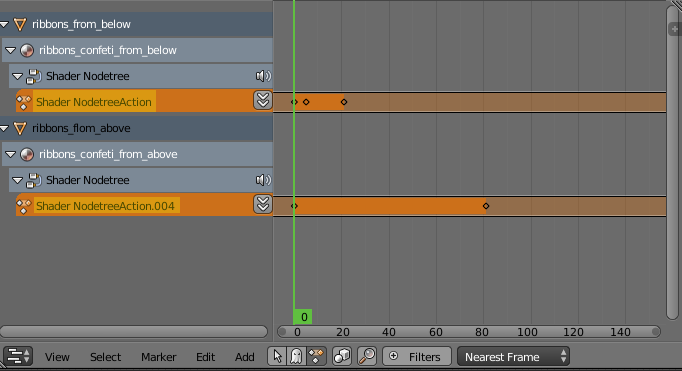 If this parameter is enabled, the timeline will be reset to the first frame after the animation playback stops. Otherwise, the timeline will be set to the frame specified by the End Marker parameter of the Play Timeline node. This node can be used to play object animation. If this parameter is enabled, animation of the scene environment (a World object) will be played. Specifies the World object, animation of which will be played. This parameter is only available if the Environment Anim. parameter is enabled. Name of the object, animation of which will be played. If this parameter is enabled, an Object-type variable can be set in the Object field. Name of an animation to play. If not specified, the entire timeline will be played. Finish Stop - animation will be played once. Finish Reset - animation will be played once, then the object will return to the starting point. Loop - animation will be playing repeatedly until it is stopped by the Stop Animation node. If this parameter is enabled, the Play Animation node will pass the control to the next node on starting the animation playback. If it isn’t, the control will be passed to the next node only after playback is finished. Can be used to stop an object’s animation. If this parameter is turned on, animation of the scene environment (a World object) will be stopped. Specifies the World object, animation of which will be stopped. This parameter is only available if the Environment Anim. parameter is enabled. Name of the object, animation of which will be stopped. Go back to the first frame after the animation has been stopped. Can be used to move the camera, including smooth interpolation of its position. A camera that will be moved. This parameter can be set directly or using an Object-type variable (if the Variable option is enabled). An object to which the camera will move. The camera’s coordinates will be the same as the object’s after the movement is finished. The camera will point in the direction of this object after being moved. Time (in seconds) that the camera will spend being moved to a new location. Set to zero by default (and in this case the camera doesn’t actually move, it simply changes its position). It can be specified manually or as a link to a variable (if the Variable parameter is enabled). Can be used to change the move style of the selected camera. This parameter specifies a camera to which the changes will be applied. This parameter specifies the new move style that the camera will use. 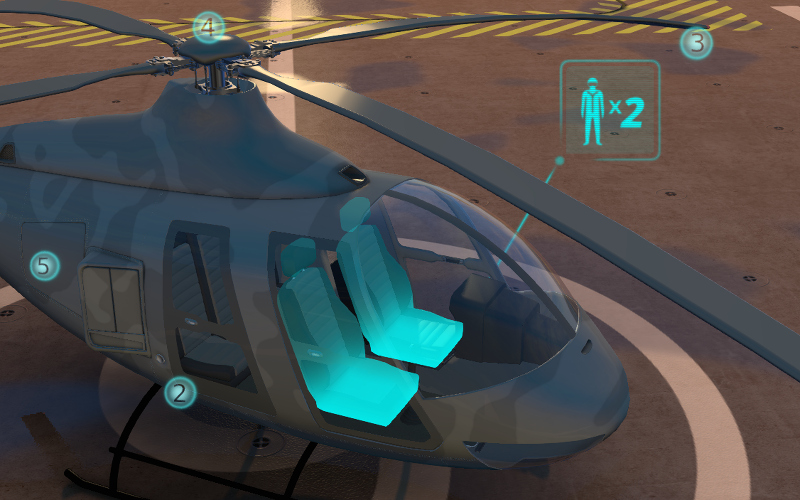 Four options are available: Hover, Eye, Target and Static. Sets the camera translation velocity. This parameter is set to 1.0 by default. Sets the camera rotation velocity. This parameter is set to 1.0 by default. Sets the zoom velocity of the camera. Default value is 0.10. Available only if the New Camera Move Style parameter is set to either Hover or Target. This parameter enables and disables using a scene object as camera’s target or pivot point (depending on the camera type). If it is activated, a text field will appear to specify the object. This parameter is disabled by default. The X component of the camera’s target/pivot pint. The Y component of the camera’s target/pivot point. The Z component of the camera’s target/pivot point. 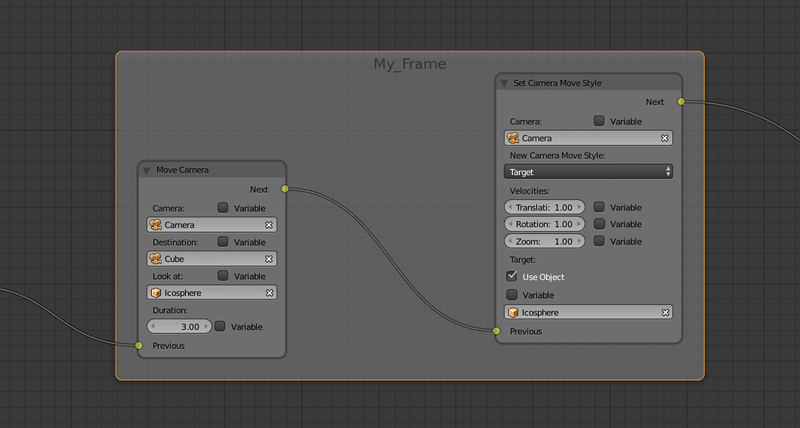 This node can be used to set limits of the selected camera. The node lists all available limits, but only ones that are compatible with the type of the camera are applied. This parameter specifies a camera to which the limits will be applied. Sets the Distance Limits parameter native to the Target and Hover camera types. Sets Horizontal Rotation Limits parameter native to Target and Eye camera types. Sets Vertical Rotation Limits parameter native to Target, Hover and Eye camera types. Sets Pivot Translation Limits parameter native to Target camera type. Sets Horizontal Translation Limits parameter native to Hover camera type. Sets Vertical Translation Limits parameter native to Hover camera type. Can be used to show 3D objects. If this parameter is enabled, child objects will be shown as well. Can be used to hide 3D objects. If this parameter is enabled, child objects will be hidden as well. Can be used to transform object’s location, size and rotation angles. An object that needs to be translated. World - global coordinate space. Parent - local coordinate system of the parent of the object specified by the Object parameter. Parent object’s origin point is used as the center of coordinates, while its angles of rotation define the directions of the coordinate axes. Local - local coordinate space of the selected object. Similar to the Parent coordinate space, but in this case, the origin point of the object itself is used as the origin of coordinates. Set to World by default. How the object will move along the X, Y and Z axes. By default, all three parameters are set to zero. 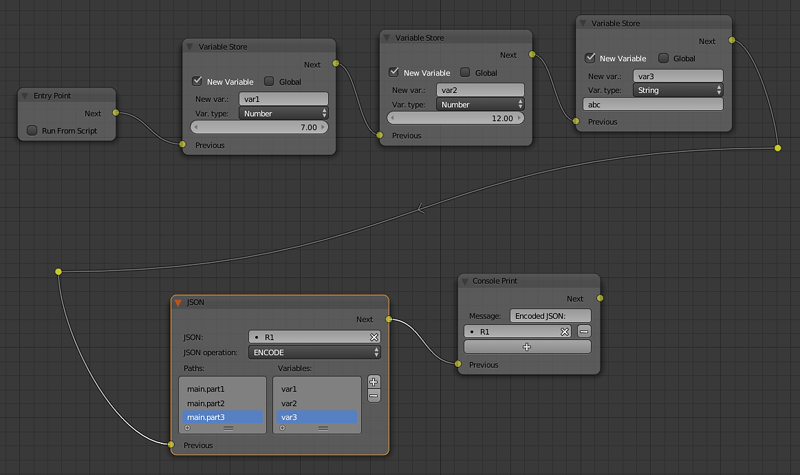 Values can be specified in the node itself or through the variables (if the Variable option is enabled). Object’s rotation around the X, Y and Z axes. All three values are set to zero by default. Can be specified directly in the node or through the variables (if the Variable option is enabled). Object’s size. Can be specified directly or through a variable (if the Variable parameter is enabled). Set to 1 by default. Time (in seconds) that the transformation will take. It can be specified both directly or with a variable (to do this, the Variable parameter should be enabled). Set to zero by default. Can be used to move objects. A target (another object or a light source, camera or anything else) to which the selected object will move. The object’s coordinated will be the same as the target’s after the movement is finished. Time (in seconds) that the object will spend moving to the new location. By default, this parameter is set to zero (and in this case, the object doesn’t actually move, it just changes its position in a moment). It can be set manually or with a variable (available only if the Variable parameter is enabled). Set the Shape Key factor. An object that needs to be transformed. Shape key that will be applied to the object. How much the shape key will influence the object. This value can be set directly in the node or using a variable (if the Variable parameter is set). The value should be between 0 and 1. Any changes of the outline effect will be applied only to an object specified by this parameter. Outline intensity. This parameter is only available if the Operation parameter is set to INTENSITY. The value can be set manually or via variable (if the Variable parameter is enabled). 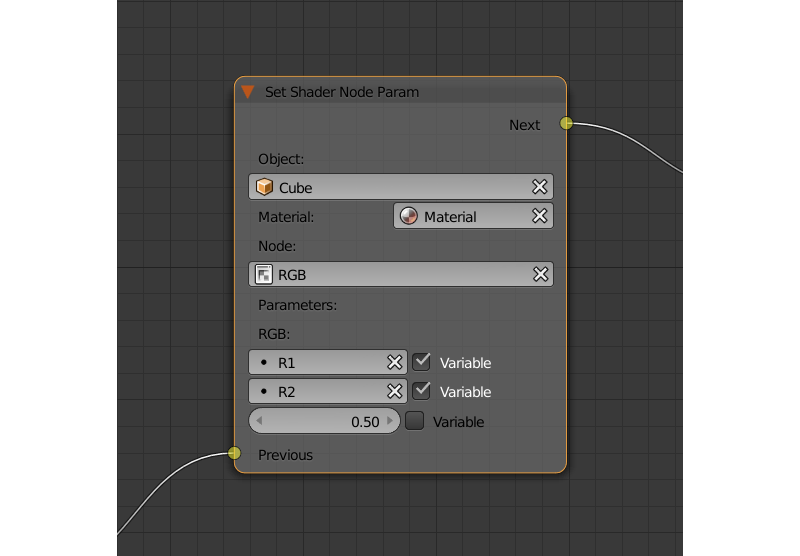 Can be used to set the value for the shader node. Currently, only Value and RGB nodes are supported. An object that has material that needs to be edited. Material that needs to be edited. It should use nodes. A node that has parameters that can be changed. For now, only Value and RGB nodes are supported. Editable parameters of the selected node. They can be set in the node itself or through the variables (if the Variable parameter is enabled). Copy attributes from one material to another. An object that has a material that will be inherited. An object that will inherit selected material. The material that will be replaced by the inherited one. Saves numerical or string value to a variable. Name of the variable. Can be selected from the list of variables or specified manually (if the New variable parameter is enabled). Variable’s type. This parameter can have one of the three values: Number (for numerical variables), String (for string variables) or Object (for object variables). This parameter is used to specify the object that will be used as a variable. It is only available if the Type parameter is set to Object. If this parameter is enabled, you can manually input a variable’s name and not just select one of the variables. This can be used to transfer the data between the application and the server. Enabling this parameter makes the variable global. Available only if the New Variable parameter has been enabled. Perform a math operation and store the result in the variables. Any of parameters (operands) can be either a numeric value or a variables. Abs returns the absolute value of the first operand. First operand. It can be specified in the node or it can be a link to one of the variables (if the Variable parameter is enabled). Second operand. Works the same way as the first. The result of the operation will be saved in the variable specified by this parameter. Can be used to perform an operation with two strings and save the result to a variable. Join - joins two strings into one. Find - writes the index of the first occurrence of the second string in the first string to the variable. If there is no occurrences, the value of -1 will be written. It should be noted that the first symbol of a string has an index of 0, not 1. Replace replaces first occurrence of the second string in the first string with the third one. Split splits the first string in two using the first occurrence of the second string as a splitting mark. Compare compares two strings. For this operation, you need to specify a logical condition. If this condition is met, a value of 1 will be outputted to the Destination variable, if it isn’t, zero will be outputted. A logical condition to compare two strings. This parameter is available only if the Operation parameter is set to Compare. Works the same way as the Condition parameter of the Conditional Jump node. The first string. Can be specified in the node itself or with a variable. The second string. Works the same way as the first. This parameter is available only if the Operation parameter is set to Replace. Can be used to specify the third string, which will replace the first occurrence of the second one. A variable to save the operation’s result. This parameter is available only if the Operation parameter is set to Split. Specifies the variable to save the second half of the string that has been split (the first half will be saved to the variable specified by the Destination parameter). Can be used to play speaker’s sound. A speaker that will be enabled. If this parameter is enabled, an Object-type variable can be set in the Speaker field. 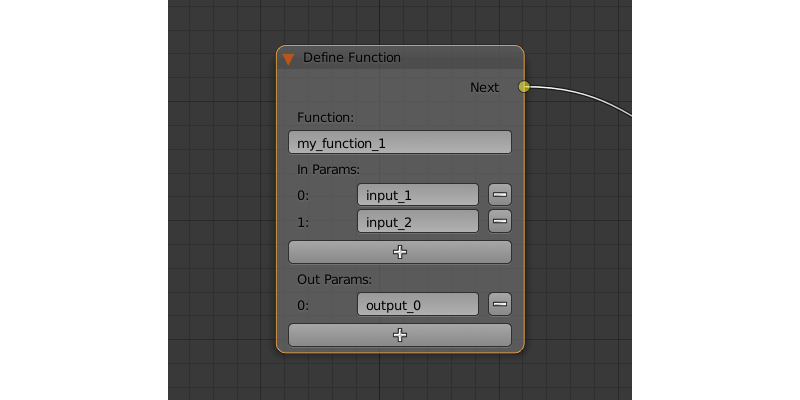 If this parameter is enabled, the control will pass to the next node right after sound playback starts. If it isn’t enabled, the control will pass only when the playback is finished. Can be used to stop speaker’s sound. A speaker that will be turned off. Send an HTTP GET request to the specified URL and save the respond’s fields a variable. GET is used to request data from the server. Set to GET by default. A web address to send request to. It can be defined directly or using a variable (if the Variable URL option is enabled). Set to “https://www.blend4web.com” by default. Specifies the variable to save the data received from the server. Indicates the media type of the message content. Consists of a type and a subtype, for example: text/plain. Set to Auto by default. Can be used to reassign the title of the HTTP request. Specifies the variable that contains a JSON object that will be sent to the server. Available only if the Method parameter is set to POST. Default value is R1. This node can be used to encode and decode complex JSON objects. A link to a JSON object that you need to decode or encode. Set to R1 by default. An operation you need to perform with the JSON object specified by the JSON parameter. Can have one of two values: ENCODE to encode the JSON object and PARSE to decode it. Set to ENCODE by default. A list of paths to the variables inside the JSON object. Paths are used to define the inner structure of a JSON object. A path should consist of several identifiers (separated by dots) that serve as a path to a JSON field. If a name of a fragment of the path consists solely of numbers, this name is interpreted as an array index. Paths are created and deleted in conjunction with variables (in the Variables list), and one path always corresponds to one variable. This list can be used both to encode and to decode JSON object. By default, the list is empty. A list of variables that will be used to either store the decoded data or to encode a JSON object (depending on the value of the JSON Operation parameter). The names and the quantity of the variables can be adjusted manually. This list is also empty by default. Allows to store any web page parameter in a given variable. The name of the web page parameter. If the parameter specified in this field is presented in the URL, then its value will be saved to a variable specified by the Destination parameter. A variable that will be used to save the parameter. The type of the web page parameter. Available values are Number, String and Object. If this option is enabled, the Page Param node will process hash parameters; if it isn’t, the node will process regular URL parameters. Can be used to redirect the browser to another page. 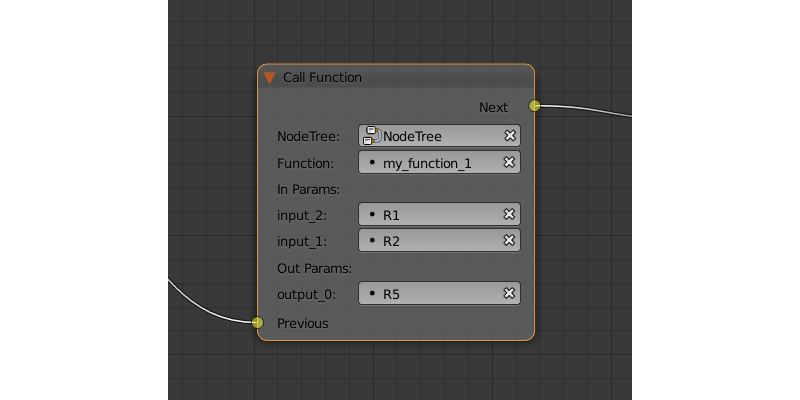 This node always marks the end of the node tree and doesn’t have any output parameters. Web address of a page that will be opened. It can be defined manually or using a variable (if the Variable URL parameter is enabled). Set to “https://www.blend4web.com” by default. This node returns the current time and date. The Coordinated Universal Time this node returns is based on local system time and a time zone. If this value is selected, time is retrieved from local system time. This value is selected by default. 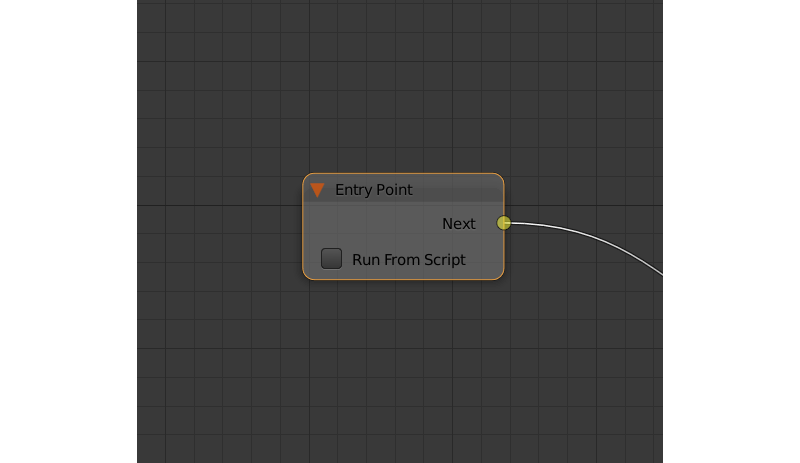 This node can be used to get the current frame of an NLA animation or a timeline. 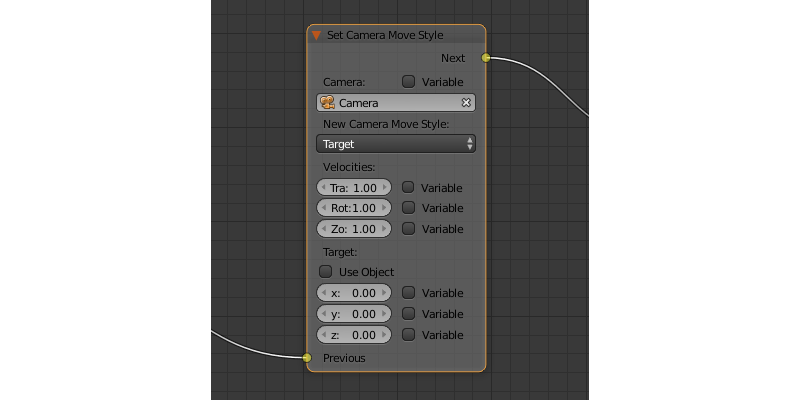 If this parameter is enabled, the node will return the current frame of an NLA animation. If it is disabled, the node will return the current frame of the timeline. Enabled by default. Specifies a variable to store the number of the current frame. Set to R1 by default. This node returns the amount of time elapsed since the previous frame has been rendered. The Elapsed logic node has one internal parameter that allows user to specify the variable to save the number of seconds passed since the previous frame. By default, it uses the R1 variable. Make a delay (measured in seconds) before going to the next node. Time (in seconds) that will pass before the activation of the next node. Set to zero by default. Can be set manually or through a variable (if the Variable parameter is enabled). An auxillary element used to separate nodes into groups. This is not required, but we recommend to use frames in complex node setups so it would be easier to read and understand them. Frame elements feature several parameters that can be accessed from the Properties side panel. These parameters include Label (can be used to set a title for the frame) and Color (defines the color of the frame). 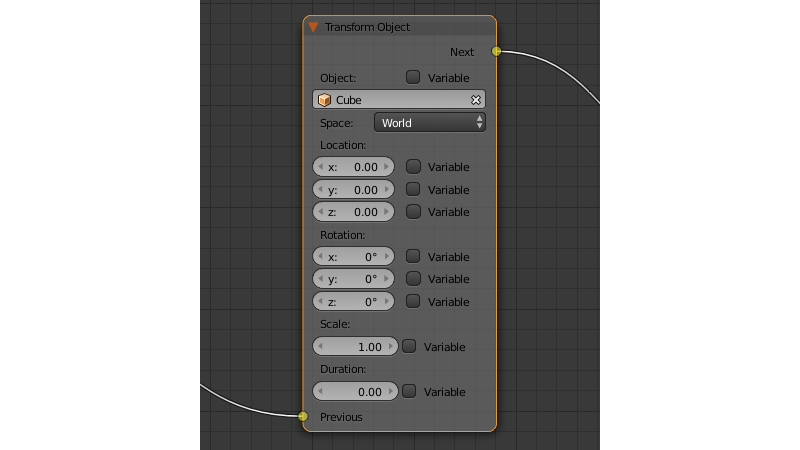 This element is also available in regular Blender node editors. This is a simple pass-through node that does not perform any operations on its own. It can be used to combine several logic threads into one or simply to make the logic node setup easier to read and understand. Previous node (or several nodes). Logic Editor also has Reroute elements, the nodes that don’t do anything aside from passing the control to the next node or to the next Reroute element. Such elements can be used to create cyclic structures or to make the node tree easier to read and understand. Unlike the Empty node, Reroute element can only handle a single logic thread. Output parameter can’t be connected to the same node’s input parameter. If you need to do this (to make a cycle, for example), you should use Reroute elements. This node prints variables’s values and additional text to the web browser console. It can be used for debug purposes. A message that will be printed to the console along with the values. A variable that will be printed to the console. By default, a Console Print node has one such parameter, but you can add new and delete existing ones (the node might not even have such parameters at all). For debugging purposes some nodes inside logic tree can be muted. To do that select the required node and press the M key. Muted nodes are not evaluated and simply pass control to the next ones. 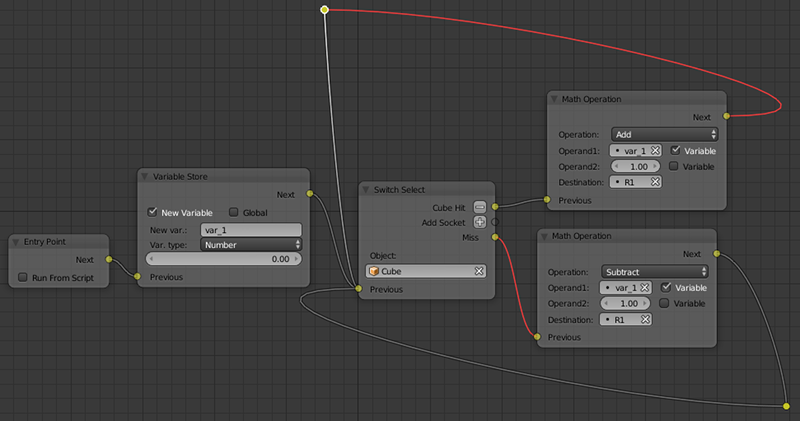 If the muted node has two outputs the execution continues from the output with negative result (Miss, False).